from 40 pcs. 0,79 EUR ea. from 160 pcs. 0,69 EUR ea. 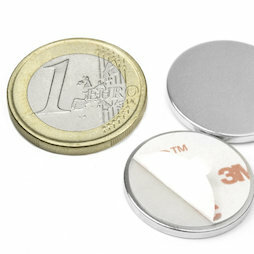 This very flat disc magnet (22 mm diameter, 2 mm thick) features a very strong self-adhesive foam side and an impressive adhesive force of approx. 2,5 kg.